Choosing a suit for a specific occasion can be tough; there are many different suits for different situations, and it is essential that you make the correct decision in order to make a good impression. The first thing you should decide to do is to hire is suit instead of buy, this is a much more cost friendly option and is ideal for suits that are only needed a couple of times a year, as most of them are. When you have chosen to hire you will need to decide on where to hire from, this will prove rather more of a challenge, purely because of the number of suit hire shops and online retailers. There are hundreds of different companies that can provide suit hire throughout the UK, although they can be banded into two categories: online and offline. Both options have their benefits. In terms of availability and types of suits available, the two options will be pretty similar; however, there are differences between the two options that may influence which you opt for. Suit hire shops have been a prominent feature in British towns and cities for many years. Companies such as Greenwoods and Moss have been around for over 150 years and provide hire to thousands of people each year. Visiting a hire shop for a suit is the traditional method and is still the most popular, hiring this way also gives customer benefits that aren’t available when ordering from an online retailer. 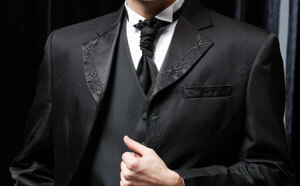 The first benefit is the fact that by visiting a shop you are given the opportunity to see suits first hand. There are many different variations of suit available and although they are commonly split into wedding wear, evening wear and morning wear, the fabrics, colours, styles and sizes come in a whole host of different options. Having the chance to touch and feel fabrics as well as seeing how they look against your skin tone is an important part of suit hire for many people. The chance to try on an outfit before making a decision is also a big factor in why people are so fond of suit hire shops. The other big benefit of hiring from a shop is the option of having a suit tailored for a perfect fit; this is particularly beneficial at weddings when suits are needed for the whole of the male wedding party in different sizes. Suit hire shops online cannot compete with ‘offline’ shops when it comes to actually seeing how a suit looks on before hiring, where it does excel, however, is the convenience. Hiring your suit over the internet is so much easier than going out and visiting different shops before finding a suitable outfit. Online shopping can be done from the comfort of your own home, or even on the move thanks to smart phones and tablet PC’s. Ordering a suit and having it delivered to your chosen address without leaving the home or office is perfect for those with little free time.